In the broad scheme of technological advances, railroads undoubtedly changed the American landscape as well as influenced cultural behavior. Mapping of growth patterns of the United States show that people began to migrate westward from the big eastern coastal cities, seeking land and personal fortune. It was a difficult and costly job to push the transportation system from the Atlantic coast, through the Appalachian Mountains, and out to the large water system of the Mississippi Valley. This was done with roads, canals, steamboats and railroads. At first, settlement patterns followed the rivers. Then, canals followed the rivers moving people and goods, particularly in the North, from cities to the Western Reserve and beyond; however, that mode of transportation lasted only about twenty years before it was eclipsed by the railroad. Railroads grew out of the commercial rivalry among cities along the Atlantic coast. Major seaports in the east began to construct rail lines into the interior. 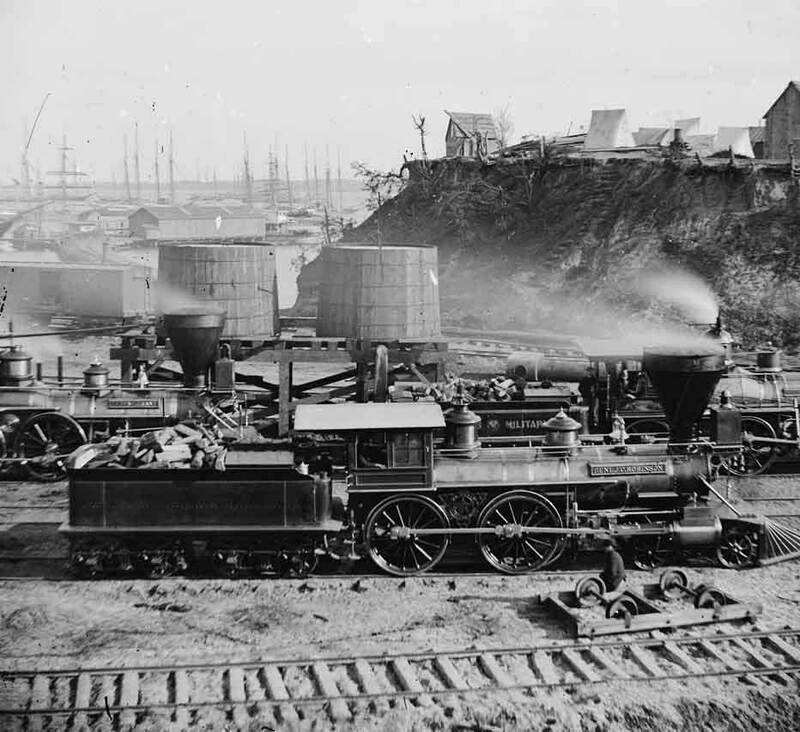 Not only did railroads move people faster, but they quickly delivered ever-growing volumes of raw materials, like oil and wood, to manufacturing facilities, and thence goods to markets. By 1860 towns and villages west of the mountains—what we now call the Middle West—were developing industries of their own. The North had overwhelming material advantages in the Civil War. It eclipsed the South in population, in manufacturing, agricultural and natural resources, in finances and in transportation facilities. The North had gained land area and resources by new states being admitted to the Union—Minnesota (1858), Oregon (1859) and Kansas (1861). This increased the northern population, about 22,000,000, which during the war years was also increased by nearly 800,000 immigrants; about 400,000 foreign-born men served on the Union side. When the war began, the North had 92 percent of the nation's industries and almost all of the known supplies of coal, iron, copper and other metals. The North also owned the nation's gold, which could be used to buy war materials abroad, whereas the Confederate wealth was largely in land and slaves. The transportation facilities of the North were also far superior to those of the south. Most of the railroad lines in the country were located in the North and the Middle West. This made it possible for the North to move more men and supplies around almost at will, and to transport food from he mid-western farm lands to workers in the eastern cities and the armed forces in the field. Moreover, with control of the navy and a large part of the merchant marine, the North was able to carry on trade with nations overseas. The South was not as fortunate in its development. Its population was only about 9,000,000, of whom 3,500,000 were slaves. The South had held tightly to maintaining focus on its agricultural economy, mainly cotton production and distribution.However, the south took comfort in its ability to win war against seemingly hopeless odds. They had some of the most ablest leaders who had graduated from West Point and had served in the U. S. Army during the Mexican War. Also, southern men were more rugged outdoor people who knew their landscape, as opposed to northern men who worked in industry. Railroads, no less than industry and agriculture, also prospered during the war. For example, the value of Erie Railroad stock increased sevenfold in three years. New lines were also built, many of them with the help of government aid and land grants. These lines helped to unite the Northeast and the Middle West. One of the most important railroad developments during the war was the decision of the Republican Congress to build a transcontinental railroad, which had been talked about for a long time. In 1862, Congress granted a charter to the Union Pacific and the Central Pacific Railroads, authorizing them to build a railway from Omaha, in Nebraska Territory, to California. Although actual construction did not begin until after the war, the subsidies and land grants showed how far the government was willing to go for business and industry. 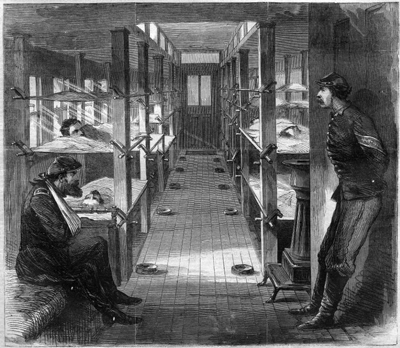 The changes behind the Union lines during the war were of great importance to the future of the nation. The growth of industry, stimulated by the war, gained momentum following the war. The railroad vividly illustrates the differences in industrialization between the North and South. On one hand more trains and track existed, though privately owned, in the North than South. An upper New England branch ran from Boston to Buffalo, while another started at New York City and ran across the southern side of New York state to Buffalo. Another major line ran from Philadelphia across lower Pennsylvania to Pittsburgh, while another line ran south through Baltimore, Washington, Richmond and down to Wilmington, North Carolina. By 1833 merchants of Charleston, South Carolina, had financed a 136-mile railroad to Hamburg, South Carolina, which was located halfway to Atlanta, Georgia. Another major southern line ran from Savannah, Georgia, north through Atlanta, Georgia, to Chattanooga, Tennessee. As the war played out, the disruption and demolition of these lines was part of the military strategy of each side. 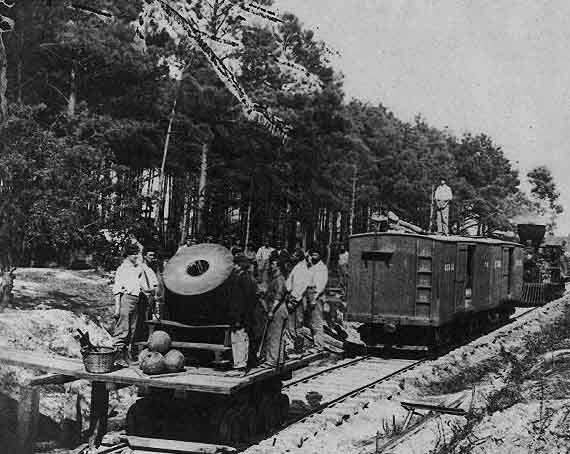 The Confederates though were quicker to take advantage of their limited railroad system; however, they lacked the industrial capacity to upkeep their trains and track. 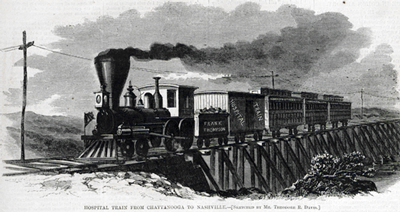 (above) Hospital train from Chattanooga to Nashville, Harper's Weekly, February 27,1864. 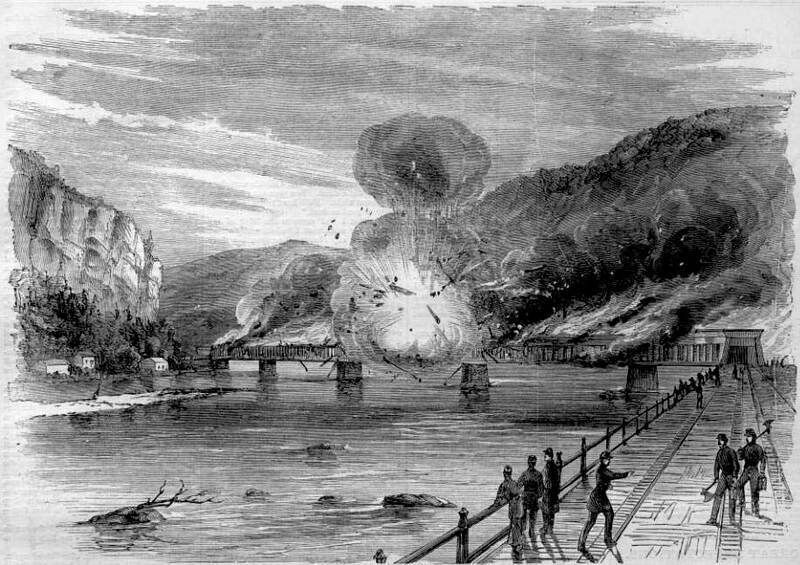 Blowing up the covered bridge at Harper's Ferry, Virginia (now West Virginia), June 14, 1861, by "Stonewall" Jackson's Confederate Army, as shown in Harper's Weekly, July 6, 1861. President Lincoln was aware of the need for improved physical transport of soldiers and arms, so in 1862 federal legislation allowed railroads to be seized for military use. Both sides targeted rail centers, bridges, and other infrastructure for destruction in an effort to gain advantage. 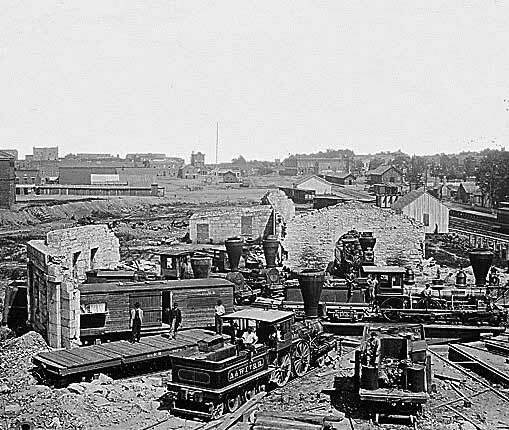 Ruins of Atlanta, Georgia, 1864, showing railroads. General Sherman targeted Atlanta because not only was it the state capital of Georgia but it had developed into a passenger and supply transportation hub for the South.